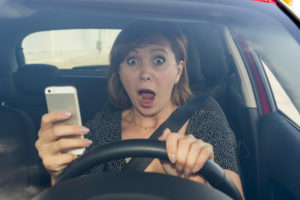 Driving while texting is a very serious traffic violation that comes with serious consequences for the driver especially if the violation causes an accident. Many people believe that they have the skills to drive and text at the same time without putting anyone at risk for a crash. However, the cold hard reality is, even if you are the world’s best texter, someone who is driving while texting is at least 6 times more likely to crash than a non-texting driver. If you or someone you love has been injured in a car accident due to driving while texting, then contact McEwen & Kestner, PLLC today to discuss your options for financial compensation and legal justice. It is against the law to drive while text. Someone found guilty of driving while texting may face serious fines and license revocation. However, these punishments do very little to console the victims of a DWT car accident. Seeing the driver without a license may provide a sense of legal justice but it will not pay the mountain of bills and rehabilitation fees needed in order to recover from the accident. It will not pay for the loss of income or the funeral costs if that accident has been fatal. It will not stop the emotional suffering and physical pain experienced by the victims of the crash. This is where McEwen & Kestner, PLLC comes in. We will work to ensure that you are fully compensated for any medical expenses, lost wages, rehabilitation and therapy, pain and suffering and other applicable damages caused by a DWT car accident. If you have been injured in a driving while texting car accident by a reckless driver, it is important that you seek legal counsel before accepting any insurance policy offer. Our lawyers have handled all types of DWT related accidents on the road. We can ensure that you are financially compensated for your trauma and get the answers to your unresolved questions surrounding the accident. Do not allow a DWT accident ruin the rest of your life. We handle all injuries sustained by a driving while texting accident including spinal and head injuries, fractures, and broken bones, permanent disability and paralysis and fatality of a loved one. Contact McEwen & Kestner, PLLC at 651-224-3833 or toll-free at 800-732-3070 today to get the legal advice and financial compensation you deserve.